Can the Power Transformer Take It? In a word, yes. It is true that we are increasing the amount of output power from the amplifier 77%, adding another 54-watts of output, so that takes more from the power transformer. On the plus side, we are relieving almost 10-watts of rectifier heater power. The solid-state rectifiers are more efficient, dropping less voltage than the GZ34, so that saves power. If you’re squeamish, you could consider sizing the new heater transformer to power all of the 7591 heaters, relieving the main power transformer of another 20-watts. Perhaps most importantly, one must bear in mind that there is typically a 14dB peak to average power ratio in music. That is a factor of 25X in power. So if you set the output for the maximum power (both channels) of 124W at peaks, average power out will be less than 5W. The power transformer will not be called upon to supply maximum power, except for brief periods. Moreover, originally, Andres operated the four new 7591 heaters on the existing power transformer. That, along with the GZ34 which was there at the time, drew about 30W more from the power transformer and it operated okay that way. So it has had its margin test. In its final configuration, after several hours of strong listening tests, the power transformer did not get noticeably hotter than usual. So we conclude that the power transformer can take it. What About Distortion, Frequency Response and SNR? Andres does not have a distortion analyzer and since he lives in Venezuela, we cannot assist. So the power output measurements had to be made with respect to the visual clipping point, rather than a distortion figure, such as 1%. As far as distortion at lower levels, we would expect those to be similar to results from an ST-70A, without the AC Balance mod. However, distortion performance will be dependent on the setting of the Negative Feedback adjustment (R37). 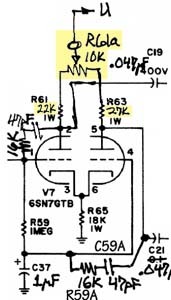 If the tubes and circuit are perfectly balanced AC-wise, and R37 is set for suitably low gain, distortion performance should be similar to the ST-70A. For best distortion performance, the AC balance mod from the ST-70A article should be included. Since this project is all about developing the maximum power from the ST-70, frequency response has not received much attention, at this point. There is no reason to think that it would be impaired, given that the Negative Feedback adjustment is not set so low in gain, that the amp is marginally stable. 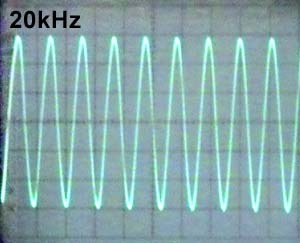 At very low gain (high negative feedback), one would expect peaking at high frequencies (perhaps in the 50-100kHz range) and maybe at subsonic frequencies, as well. Either of these could lead to a rise in response at the extremes of the audio band. However, if the negative feedback is set properly, this should not occur. This project did not deal with the preamp sections of the ST-70 and those are almost certainly the main contributor to noise in the amp. We addressed those issues in the ST-70A. Andres included the line amp and power amp mods that allow lower power-amp gain and improve SNR. Given that the Negative Feedback adjustment is done properly, noise should be similar to the previous excellent results. With the performance of the project being so surprising to experts, we felt it necessary to pursue a series of verification tests, to give some assurance that the measurements are correct. David Gillespie kindly volunteered to conduct a lab experiment to measure the maximum undistorted power, which the ST-70 transformer can handle. We were particularly interested in the performance at 20Hz, since low frequencies are where saturation effects are most prevalent. That is because the inductive reactance of the transformer is proportional to frequency. At low frequencies, the reactance falls and magnetization current (drawn by the equivalent parallel inductance) of the transformer increases. That increased current tends to saturate the core, causing distortion and reducing the output level, if the drive source is susceptible to loading. The idea is to drive the transformer in reverse and measure the maximum undistorted power that it can handle. From the point of view of the core, it doesn’t matter much, which way the power is flowing. 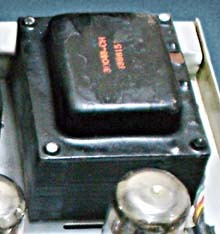 The ST-70 transformer (seen below left) normally works with a plate impedance of 6500-ohms. To represent the half-impedance operation used in this project, a precision load of 3250-ohms was placed on the plate winding side, which is serving as a secondary in this test. Since the DH-220 power amp has a very low impedance output, the output of the transformer will only limit when the core becomes fully saturated. This represents the maximum amount of power which it can handle. The generator frequency was set to 20Hz. Output was driven to the onset of saturation as viewed on the output of the plate winding. There was no clipping as is classically viewed, but a very abrupt change from a normal looking sine wave, to a strong spike, typical of that which crossover distortion produces. At just below this point, a measurement of output voltage was made with an HP-3466A DVM. This showed 506.6-Vrms across 3250 ohms, or 79-watts RMS. That demonstrates that the ST-70 output transformer is capable of supporting the undistorted power claimed by Mr. Fontanills, given sufficient drive. The quality of visual clipping used to establish maximum power. Accuracy of the load resistance. AC meter frequency response flatness. Mr. Fontanills patiently followed the procedures that we agreed upon and provided documentation of the results. He included photos showing meter and oscilloscope results together, with settings visible. This was very reassuring. When the camera shutter speed compromised the 20Hz waveform photos, he went to considerable effort to obtain better ones. One person’s visual interpretation of “just below clipping” might differ from another’s, particularly at very low frequencies where tube amp limiting is often indistinct. That is why maximum power is commonly measured at a specified amount of distortion, as measured on a harmonic distortion analyzer. At left, Andres verifies the 8-ohm load used for power measurements. We wanted to make sure that the TekPower DT9602R (above) which was being used for AC measurements was indicating accurately at the frequency extremes. To test that with precision, a procedure was used which uses the DC-coupled oscilloscope, without a probe, to maintain the flatness of the generator. By expanding the scale vertically and centering the top of the trace on a graticule line, the level of the generator can be adjusted at each frequency to a precise level. The results at right show very good flatness over the audio band. With all of these verification tests completed, we are satisfied that the power measurements are reasonably accurate. Of course, since we can’t be there to see for ourselves, we cannot guarantee that. But hey, we’re talking about hotrodding here, not space engineering! It looks to us like Andres has done a great job of documenting his creation. For those who have worked with vacuum tube amplifiers at low frequencies and have experienced the effects of saturation, what we are presenting here might be hard to believe. An ST-70A’s transformer output drops from 35W at 1kHz to 19W at 20Hz, with standard push-pull drive. It seems like the 19W is a limit resulting from core saturation. How can it be able to deliver 53W at 20Hz with push-pull-parallel drive and half-impedance operation? Saturation is a soft rather than hard limit. As long as sufficient current is available, secondary voltage will track primary voltage, well into the saturation region. When a transformer is operated at half impedance, reactance of the core (including saturation effects) is scaled up by a factor of two, relative to the load. To clarify this, let’s look at the equivalent circuit of the ST-70 output transformer shown at right. First, the primary and secondary resistances usually aren’t significant and neither are the leakage inductances, at low frequency. That leaves us with just the core loading and an ideal transformer. By “ideal,” we mean that it losslessly transfers power between primary and secondary (according to the turns ratio) and doesn’t put any loading across the signals. Notice that, with just the core loading and the ideal transformer, there is no mechanism for voltage loss between primary and secondary, at low frequency. Hence, secondary voltage tracks primary voltage, in spite of core saturation. What happens is simply that the core loading just gets worse and worse as we go lower in frequency and higher in power, as a result of core saturation. So, if you can drive it with a stiff enough source, low frequency performance can be greatly enhanced. This explains the results that David Gillespie measured in the lab. When we operate at half the normal impedance, the effect of the core loading is halved. However, the core loading is nonlinear and the tube output stage has significant impedance. To minimize distortion, we need to maximize the negative feedback around this. That is done by the ST-70A mods. Extra development effort was needed to maintain both high and low frequency stability, while accommodating 30dB of negative feedback. Naturally, there are limits to this transformer model, particularly with our assumption that leakage inductances and winding resistance effects are small. Ultimately, saturation will become so severe that these are no longer valid. Nevertheless, the empirical fact that the ST-70 output transformer supports 79W at 20Hz, is a testament that it goes a lot further than many thought. As mentioned above, the AC Balance mods (at right) of the ST-70A article were not used here. Having those would reduce distortion and make the performance less dependent on perfect tube matching. It would be implemented exactly as was done in the ST-70A. The fact that each former output tube now becomes a parallel pair, does not affect the mod. In the ST-70A, we increased negative feedback from the stock value of 20dB, to 30dB. While much effort went into optimizing the compensation networks to maintain and actually improve stability, there are tricks left in our engineering toolbox which might allow us to squeeze out more feedback at low frequencies. If that is possible, it could benefit this project, reducing distortion from nonlinear operation of the output transformer cores. Stay tuned. 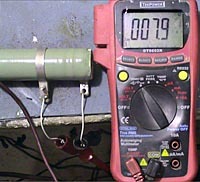 Conventional wisdom once held that applying plate voltage to a tube before the heater has warmed-up could degrade the cathode. Unlike some of their vacuum tube counterparts, solid state rectifiers develop full B+ voltage almost instantly. 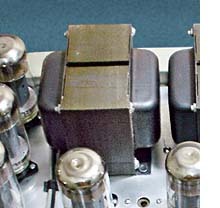 As a result, many vacuum tube enthusiasts advocate providing a means of delaying application of B+, when solid state rectifiers are used. The RCA transmitting tube manual specifically warns against applying plate voltage to mercury vapor and high vacuum type rectifier tubes until the filament has reached full voltage for a rated period of time. But by way of parenthesis however, they specifically exclude receiving type rectifier tubes from this requirement. 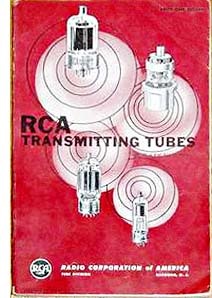 None of the RCA tube manuals warn against applying B+ to receiving type tubes before their cathodes are fully heated, even basically endorsing the idea of switching the filament voltage only in battery portables as a means of turning the radio on and off. It seems that, while transmitting tubes with thousands of volts of B+ might benefit from delayed B+, it is doubtful that it helps tubes in normal hifi applications. You can hear very clearly, all of the notes of the guitar. “Several Species of Small Furry Animals Gathered Together in a Cave and Grooving With a Pict” In my opinion, the greater clarity of the “sounds of silence” in a cave, can be felt in this song. The various high frequency tones of these strange animals can be heard clearly. We have reported on Andres Fontanills’ Supermods technique and it doubles midband power of the (already enhanced) ST-70A, with one channel driven. It also increases total power (both channels driven) by 77%. Perhaps even more amazing is the fact that 20Hz (single channel) power is increased by a factor of 2.8-times. Half-impedance operation of the output transformers. Doubling-up the output tubes (in parallel). Increasing negative feedback, using sophisticated loop compensation. Use of a solid state rectifier, filament transformer, and doubled first-filter-cap. The only caveats we have found are: (1) Andres does not have a way to measure distortion and (2) the mods operate the power and output transformers beyond their specs. 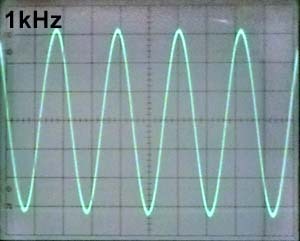 However, distortion at lower levels can be comparable to the ST-70A and at higher levels, the waveforms look pretty good on a scope (shown above). No ill effects on the transformers have been noted (but please proceed at your own risk). One can only wonder at the (perhaps more modest) gains which might be achieved by modifying standard push-pull (as opposed to push-pull parallel) amps for beefier output tubes and half-impedance transformer operation. Congratulations to Andres for demonstrating something that experts said was impossible. Drilling steel with a spade (wood) bit is no small wonder, either. 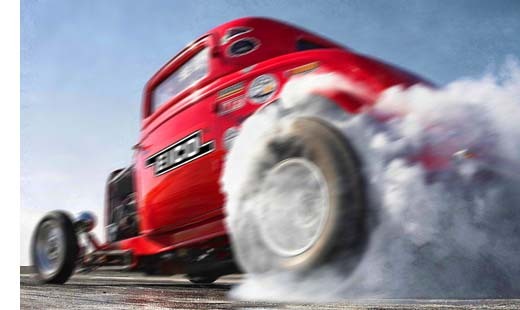 <wink> Happy hotrodding! Our thanks go to Andres Fontanills of Venezuela for his fantastic Supermods technique and for answering a seemingly endless series of questions and requests for measurements. Thanks also for the fine pictures. Special thanks go to Dave Gillespie, who expeditiously performed and documented the lab test on the ST-70 output transformer. He showed that it is capable of supporting 79W of power at 20Hz. That went a long way in motivating a deeper look into this project. Please see the previous page of this article for reader comments.